Hands down. No questions asked, this TopShop tunic dress from Nordstrom has been my BFF over the last few weeks. I mentioned last month how I found it on a whim when I was returning something for Ross. Who would have thought that it would become such a staple in my closet? No joke. I have worn it at least five times, if not more. It's been so good that I invited it to see the sites and sounds of California. The temps are still over 100 degrees here in the Austin area, but I must admit that a teeny-tiny part of me is sloooooowly craving cooler temps and wanting to kinda sorta add splashes of Fall into my wardrobe. Layering with long sleeves is not in my near future, but adding sleeveless ones aren't so far fetched. My utility military vest came to the rescue again. And to think I almost added it to my Poshmark closet. What was wrong with me?!? It has been a champ for more than a year, always amps up an outfit and brings a special look to simple styles. Fab news for you, this TopShop tunic dress is now 50% OFF!!! Yep, it could be yours for half the price that I originally paid. It kind of makes me sad (mad), but at the same time I am 100% okay with paying the full price tag because this one definitely exceeded it's cost per wear. Don't be surprised if you don't see it again real soon. It's been that good to me. This is one transitional look I might have to replicate soon! You indeed have been so lucky to find that versatile dress....the color is so Fall and works well with any kind of boots! The dress is stunning, I love the vibrant orange colour. The leopard print clutch is perfect for a pop of pattern in this look. I love when you find a piece of clothing that's unplanned and it becomes your favorite item to wear. Love how you wore it with tan and glad you didn't give up that great cargo jacket! If you're craving the fall (I totally am) but it's Indian Summer in your area, try using fall colors with summer silhouettes, or even just using fall colors for your make up and nail polish? I'm happy you didn't get rid of the vest, it works so much! P.S. I had to delete the first comment because too many typos. Sorry, I am typing from my phone. Have a Lovely Wednesday, Gorgeous Lady!! What a great dress! Love the color and it looks comfy too. Have a wonderful day! Oh my gosh, that dress is seriously PERFECT. Love love love! And you look amazing, as always, Shanna!! These colors look so good on you such a great combo. I need a vest like this one. That is a GREAT dress, but I really love how you paired it with the military jacket. I'd never have thought to do that. CUTE! Well no wonder you've lived in this tunic, it is adorable! I love the color and the length is perfect. I've been putting a lot of pieces on repeat because its the end of the season and I want to get some wear out of my favorites. This look is great, and you look amazing. I've been eyeing the green version of that vest! I think I need it before winter gets here!! This look is right of my alley...you are gorg my friend! Hoe adorable is that orange dress! Love it with the vest! When you have a great piece, you HAVE to wear it a ton! Love this outfit. Orange looks so amazing on you Shanna! I looove that clutch! And this just gave me an idea for an outfit come fall. I have a skirt in that color and some similar booties. I do the same thing with new favorites:) So hard to stop wearing them! I love your gorgeous jewelry! I need that dress for my Vols!!! LOVE those rings too. I do love a dress with pockets and that is one awesome piece. Liking this look. I am so not ready for fall but then again today I wore my new booties so maybe some part of me is.. I love it when i find something I love that I can wear over and over! i'm also crushing on your jewelry! I love when I find something that just really works for me. I always feel like I got the best buy ever then! What's your nail color? I'm always looking for a good orange. I love this look so much!! I adored the dress the first time you wore it and now that it's on sale, I might have to make it mine! Glad you didn't get rid of that vest! Def a closet staple for sure! How cute are you?? I'm obsessed with that leopard print clutch! 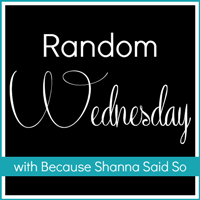 Thanks for hosting this link up! 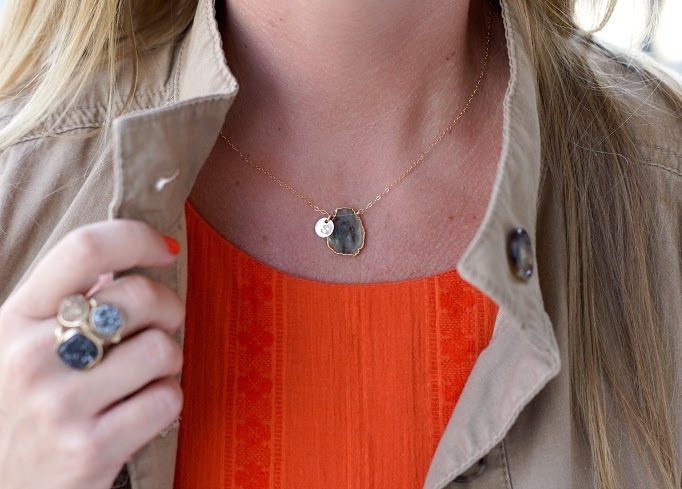 This is the perfect transitional piece! Good thing you didn't end up selling it, haha! This is a great look! I can't believe you're wearing little booties in over 100 degree weather!! I just love that dress! It is so adorable on you! The vest was the perfect addition to this looK! Such a cute dress! It looks like one versatile dress so that's something you can't pass up! I wish layering with long sleeves was much closer...but I'll take layering with cute vests in the mean time ;) These colors combined with the leopard...LOVE!!! I'm loving your accessories! That necklace is so pretty! I really like this outfit and I adore the dress, I'd wear it like crazy too. That ring is amazing and I love that color dress on you! Love the embroidery details in your dress! 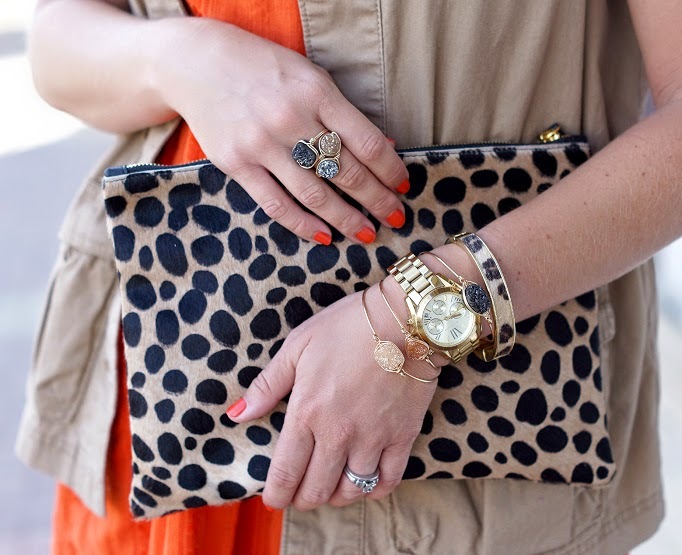 Orange and leopard print were meant to be worn together! I love how bright the dress is - I'm usually afraid to wear things so bright but this is so pretty! Your ring is amazing Shanna! 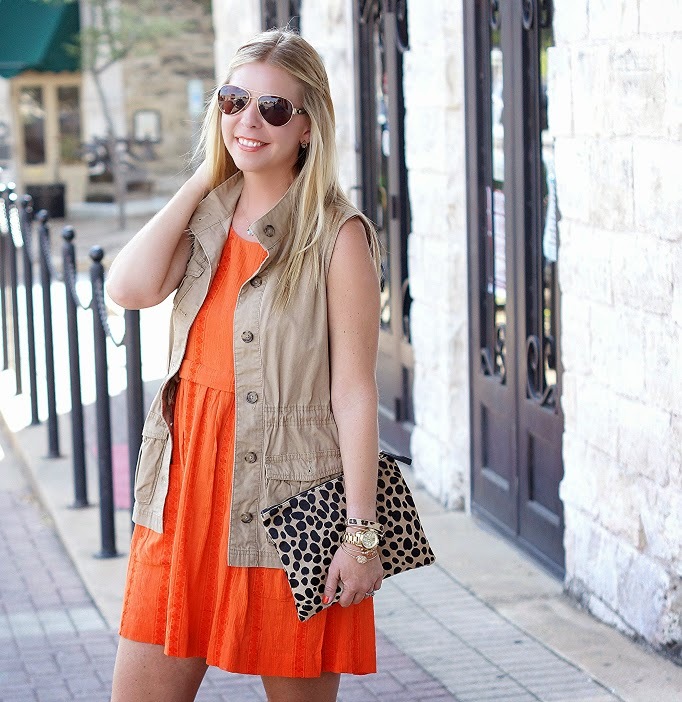 You look gorgeous in this topshop dress and Old Navy Utility Vest. Love your hair and booties too. 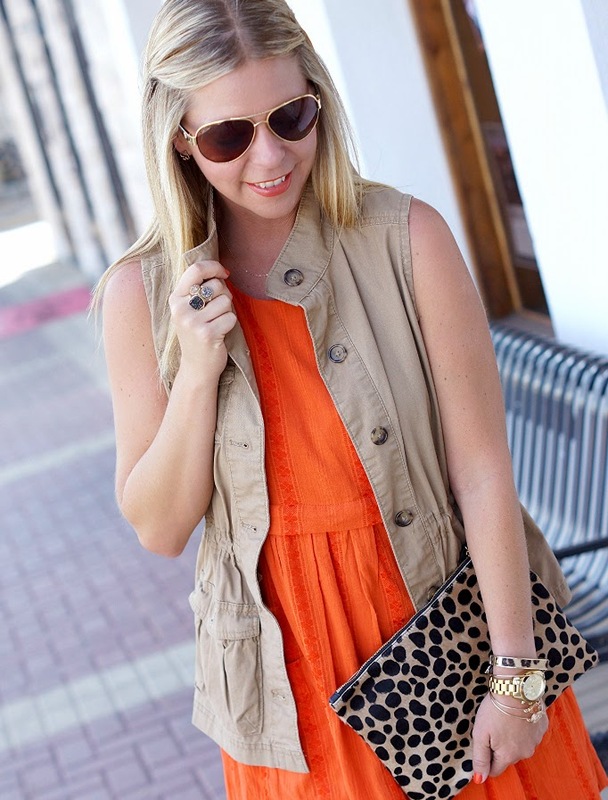 I have an almost identical orange dress from old navy that I never thought to pair my cargo vest with! Thank you for the inspo my friend! I can't believe you were going to get rid of the vest...it's such a great light layering piece! Love this dress on you! Shanna, you look gorgeous as usual and I am adoring this entire look. Just fabulous! Love this outfit and the clutch is amazing! It's hot as heck here too. So ready for fall and layers! Orange looks amazing on you! The dress is so cute layered with the vest. We had a cooler than usual August but I'm hoping it stays warm through the end of Sept here. Have a great weekend!